My Favorite Things in Stitches. MY FAVORITE THINGS in Stitches: Designer of Bags, Dolls, Stitcheries, Bears and Quilts. I have just returned from a road trip through France and Spain with my sister Marg for her 50th birthday. We arrived in Paris for 5 days then hired a car and drove up to Normandy staying at Bayeux, then across to Le Mont-Saint-Michel to Angers, Rocamadour, Barcelona, Monaco, Annecy then back to Paris to fly home. OMG what an amzing trip. I cannot begin to tell you what we saw and which place was my favourite. One of the highlights of the trip was the Bayeux Tapestry. It was created in the 11th century, is the only masterpiece of its kind in the world. This embroidery is over 70 meters long and 50cm high, retraces the history of the conquest of England by William Duke of Normandy. It's a must if you are ever in the area. Here are a few photos from our trip. The lock Bridge in Paris. We put a lock on the main bridge with our name and date. (It is a lovers bridge BUT we wanted to leave our mark). I finally finished my sister's 50th birthday quilt. I did start it 3 years ago but got distracted designing in between, thats why I needed to start that long ago. I thought long and hard before I began the quilt. I couldn't decide wether to use 1930's fabric or civil war as she loves both BUT my final decision was to draft a pattern from an antique quilt I brought in Houston 4 years ago, Marg loved the block in the quilt when I brought it. She loved her quilt and has it on her bed. Hi everyone I just thought I would "show off" with this Christmas Quilt that’s been in the making for 10 years. My sister Marg was in Canada 10 years ago and brought these gorgeous Santa blocks while she was there. 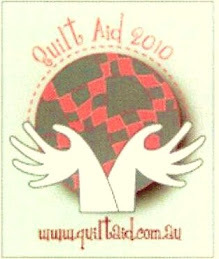 Our group of crafty ladies in Ballarat decided we would all make the blocks and set them into a quilt of our own design. We all started with enthusiasm with the first few blocks then Christmas come and went and the blocks were put away. Over the years I have done a block or two and before I realised they were all done. So this year while I was having the year off from designing, I found these little blocks in a bag while tidying my craft room and decided to get out my graph book and draft a quilt for the blocks. I am still to add borders BUT so excited it’s now complete and will be ready for this Christmas along with my newly extended family room. My Ballarat friends, Marg, Pam, Elizabeth, Rose, Jenny and Elsa are all keen to dig out their blocks and get started again on theirs. How many of us start a quilt then put it aside to get started on yet another one. I did say to my sister the other day that I would complete all the quilts that I have started over the years IF I live long enough and stop buying more….haha … as if that will happen. Sorry it been so long since I have been in for a visit, BUT this morning as I sat at my desk and looked out at the sunshine, I decided to just take a minute to say hello and catch up. In February I went to Halls Gap for the week learning a new textile medium “felting” with tutor Martien van Zuilen. I had a wonderful week with a fantastic group of ladies. We completed a (felt mandala) a round floor rug. To actually make a rug from just a felt fibre was so rewarding at the end of the week. I was so far out of my comfort zone to begin with BUT so pleased with the end result. In April my hubby and I flew to Perth and drove along the WA coast up to Broome stopping in on my friend Sue and family in Roebourne just out of Karratha for a few days along the way. What a wonderful time we had. Finishing our journey at the beautiful Broome Cable Beach resort . I even braved the camel ride…haha. In June on the 16.6.2012 our gorgeous grandson “Lincoln James Gillespie” was born. He is such a beautiful little man. Oh Boy!!!! I love being a granny…haha. Christmas will be fun this year with a little one in our home again. In September my poor hubby had a work place accident that severed half of 3 fingers on his right hand….yet he is right handed of course. That has had a huge impact on his work (lucky he has his own business) but is improving day by day. I have been still teaching my fabric painting throughout the year at Quilters Harvest Warracknabeal, Sovereign Needlework’s Ballarat and Mill Rose Cottage Ballan. I have just started designing again as I have had the year off just catching my breath. I have a new floral quilt, baby quilt, Christmas table runner etc in the making. Here is a tiny peak at my new baby blanket stitchery. Hope this year has been kind to you all. We have finally moved our office from the house into a old guards train carriage. Old guards carriage. Now new office. The carriage had been out in the weather with the doors wide open for years and was in very poor condition when we moved it to our block. A builder we know who loves a challenge worked on it for months replacing windows, getting the doors to work, restoring the old wooden floor and adding two rounds windows in the ends of the carriage. air-conditioning, timber floor, toilet, kitchen sink and office, decking out the front and still waiting for a curved roof over the decked area. I think you could actually live in one of these things if you were on your own, its so spacing and comfortable. A view through the round window. I am just back from a workshop in Hobart at The Quilted Crow. What a wonderful day had by all. The setting, company and food were divine. It was my 1st visit to Deirdre & Leonie's shop in their new location "Newtown" a gorgeous little suburb only a few minutes drive from Hobart. The shop looked fantastic and well worth the visit if you are ever in the area. Set in an old church filled with old suit cases, cupboards & pidgeon holes housing fabric, kits & threads. You do forget how beautiful Tasmania is until you go back and see the rolling hills, old houses and quaint shops. Thanks to all for a wonderful day......I had a ball. I have been working on my projects for a workshop at "The Quilted Crow" in Hobart 3rd March 2012. It will be held at their shop which is set in an old church, it looks divine, so numbers are limited. If you are interested in joining us for a day of fun, food and friendship ring the girls ASAP to book your seat. Here is a peek at part of one of my projects that I will be sharing with you on the day. All will be revealed on "The Quilted Crows" blog a few weeks before hand. I had some exciting news just before Christmas...."I AM GOING TO BE A GRANNY" for the first time. How exciting is that.....lol. My beautiful son Ian and his gorgeous wife Megan are due in June. I hear being a granny is fantastic and can hardly wait. You can spoil them, then hand them back. I saw this cute moose after I found out about the baby and couldn't resist it under the Christmas tree. "this child isn't going to be spoilt"....haha. To all those grannies out there.....Any Tips ? Since my last entry, I have been busy and very slack writing my blog......sorry. I promised myself that I would write once a week BUT the weeks flyby then turn into months....lol. So please encourage me with your comments. I will be having a few giveaways as well, so keep checking in when you have the time. I did the Australian Quilt Market in November at the Convention Centre in Melbourne. Thanks to all who dropped in to say hello. Karen (a dear and patient friend of mine) and I had a wonderful day out early December. We went for a flight over Melbourne in a seaplane from Williamstown beach. It was Karen's Christmas present from last year from her family. She asked me to go with her. Then my son Beau had the accident on 5/1/2011 so that put it off for 11months. I had forgotten about it BUT she waited until all was well at home before asking me again to join her. How good of her to wait that long. We had a fantastic day out. Williamstown is beautiful. It was worth the wait. After the present giving we drove her around town in my convertible to spread the Christmas cheer. The kids loved her....lol. We had Christmas Day at my place this year, and what a day to remember. The sky's opened up with hail the size of golf balls. We weren't as badly hit as some parts of Melbourne BUT the noise was scary and the cars dented. They fell like bullets and bounced metres into the air. I hope you all had a Christmas to remember (in a good way) and wish you all good health, good luck and hope to see some projects finished in 2012. I would love to hear how your Christmas went. The weekend found us in Warracknabeal at a wonderful workshop hosted by the lovely Shirley and Dell from Quilters Harvest. We were welcomed to Warrack with a homestyle dinner of casseroles and amazing desserts. Thank- you to Dell and Vic for your gengerous hospitality. Ladies from far and wide joined us to enjoy two days of food, fun and fabric. I launched two of my new designs that include 'Birdena' - the pin cushion and scissor keep and a lovely yo-yo shoulder bag (pictured). It was great to be joined by Viv Robinson from Viv's Creations and Lisa Cantlay from Fig"n"Berry sharing their sewing expertise! The hospitality continued Saturday night when we were taken to the 'Rusty Nail' for dinner. The restaurants history and memorabilia was amazing and impossible to take in one night. Now there are two attractions to Warrack - the Quilters Harvest and the Rusty Nail! Block of the Month. Click on picture to view all 12 blocks and finished quilts.